Between whirlwind and lull, prowess and poetry, Saltimbanco takes spectators on an allegorical and acrobatic journey into the heart of the city. Following the critically acclaimed UK tour of Quidam , Cirque Du Soleil, is to return to the UK with an arena tour of its vibrant signature production SALTIMBANCO, created by Franco Dragone. This timeless Cirque opus hits the UK Arenas for the first time including dates at The NIA, Birmingham from 17 - 27 June 2010. Saltimbanco is Cirque du Soleil’s longest running major touring show which has toured the world since 1992 to wide-spread acclaim and has enjoyed sell-out success across the world in Europe, North and South America, Australia, Japan, and New Zealand performing to over 11 million fans. Classic Cirque at its best, Saltimbanco is a thrilling and kaleidoscopic celebration of awe inspiring artistry and agility. It features breathtaking acrobatics and unbelievable athleticism during solo spotlights and epic ensembles. With a cast of over 50 high-caliber artists hailing from 20 countries Saltimbanco is set to enthrall. From the seemingly impossible balancing, jumping and spinning during the Chinese Poles or the Russian Swing to the gravity-defying Bungees and Trapeze, the crowd pleasing Juggling and Acrobatic Bicycle, to the celebrated and very unique Clowns. Technical expertise and extravagant design are woven together by uplifting spectacular costumes, amazing lighting, humour and enchanting music and magic. 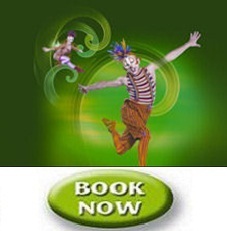 Full of colour, amusement and amazement, Saltimbanco is a fun show for the whole family to enjoy.